Charlie Young beach is actually the northern portion of Kamaole Beach Park #1. It was named after the man that owned the house just above the beach for many years. This is a beach that is a favorite of the local population and on most days you will be able to see a series of fishing poles methodically planted in the sand or a beach volley ball game in progress. The sand on this beach is a beautiful golden color and has a fine texture. The sand will extend into the ocean and makes an excellent ocean entry without having to worry about stepping on rocks or coral. Charlie Young Beach is one of the very best beaches on the island for swimming. The distance from the Charlie Young side of Kamaole Beach #1 to the opposite side is about one-third of a mile and makes for a fantastic down and back swim. 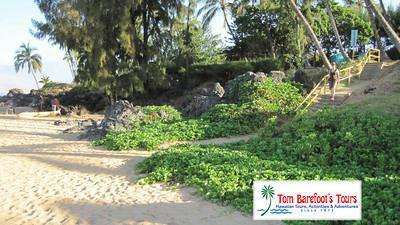 Snorkeling is good as well but only on the beach extremities along the rocks. The best time to go to Charlie Young Beach for a swim is in the morning hours and usually the earlier the better to avoid the normal trade winds which will fill in by late morning or early afternoon. This is also a good location for stand-up paddle boarding and you will often see a number of boards out on any given morning. Amenities at Charlie Young Beach are few. There is parking on the side street at the top entrance to the stairway which takes you down to the beach. There is a portable restroom and a shower. A lifeguard tower is located at Kamaole Beach #1 just a couple of hundred yards down the beach. Charlie Young Beach is the most beautiful in the morning hours. In the afternoon the trade winds usually kick up and sweep the majority of the beach users away. The surf here is generally small in the Winter months and a bit more active in the Summer. We advise all beach users to check in with the life guards for an update on the current ocean conditions before entering the water. The main entrance to Charlie Young Beach is located at the end of Kaiau Place at the intersection with Ili Ili Road. Just past the shower you will find a concrete staircase that is the main point of access to the beach. Parking here can be tricky, but there is generally space in the lot that is located on the corner of Kaiau Place & South Kihei Road.